Auction giant eBay requests 128 million users to change their passwords after hack. 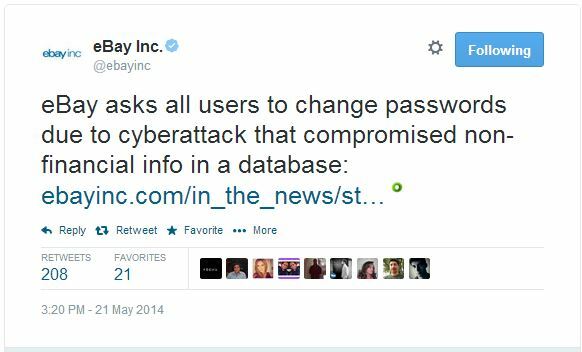 In a blog post from the company, eBay Inc. said a cyberattack “compromised a database containing encrypted passwords and other non-financial data.” There is no evidence that the compromise resulted in users' financial or credit card information being stolen, but the company is telling all users to change their passwords. Users need to be alert even after their passwords have been changed. After a breach like this the risk that hackers will use their personal information to commit identity fraud and launch phishing attacks increases. As always, do not click on links in emails, or give personal information over the phone. If you need to discuss your account information, please contact eBay's customer service by phone or via their website. "The eBay breach is yet another password issue like Heartbleed. It is really important that people take this seriously, " said Ondrej Vlcek, Chief Operating Officer of AVAST Software. "Data from our recent survey shows that nine out of ten people intended to change their passwords after Heartbleed, but only 40% took action. This careless attitude is completely irresponsible; people have to take the initiative to protect themselves." A password manager like avast! EasyPass helps encrypt and protect personal information online, with random, strong passwords. Learn about creating strong passwords by reading our blog, My password was stolen. What do I do now? Two weeks ago, eBay discovered that cyberattackers broke into their corporate network through a small number of employee log in credentials. They revealed that the database was actually compromised in late February and early March, and included eBay customers’ name, encrypted password, email address, physical address, phone number and date of birth. However, the database did not contain financial information or other confidential personal information. Yesterday in an unrelated attack, eBay's UK and French advertisement network was compromised and showed fake Java and Flash updates. This malicious advertising replaced the visited page and an installer offered a Potentially Unwanted Program (PUP). As of last night, they were working to resolve the issue. avast! Antivirus detected the compromise and alerted users. "Third party ad networks are useful to attackers because the number of connections delays taking malicious content down," explained Honza Zika, malware analyst in the avast! Virus Lab. "Instead of a normal ad, the attacker deploys a code that redirects to the attacker's page. It's designed to look like an official Flash or Java page, but installs unwanted toolbars, addons, extensions or other PUPs. avast! detected this and protected our users." Thanks to independent researcher Malekal for his work on this compromise. Read more on his blog.